(Nanowerk News) MIT researchers have developed a new way of creating surfaces on which droplets of any desired shape can spontaneously form. They say this approach could lead to new biomedical assay devices and LED display screens, among other applications. The work is described in the journal Nature Communications ("High-resolution liquid patterns via three-dimensional droplet shape control") by associate professor of mechanical engineering Evelyn Wang, former postdocs Rishi Raj and Ryan Enright, and graduate student Solomon Adera. Wang and her team have worked over the years to create nanopatterned surfaces that can either repel or attract fluids. But the new work represents the first time, she says, that “we can control the shape of the contact area of the droplet” — that is, the shape of a droplet’s base on a substrate material. Unlike ordinary round droplets, these can be engineered to have a base that’s square, hexagonal, triangular, or just about any other shape. This could allow more closely spaced patterns on surfaces, eliminating the gaps that inevitably occur between round droplets. This closer spacing could be useful in applications such as printing plates, or the screens of LED displays. The concept is quite flexible: Shapes can be determined by patterning a surface with physical structures, such as nanopillars, or through chemical treatment. “Either way, we change the contact area of the droplet, based on how we design the surface,” Wang says. 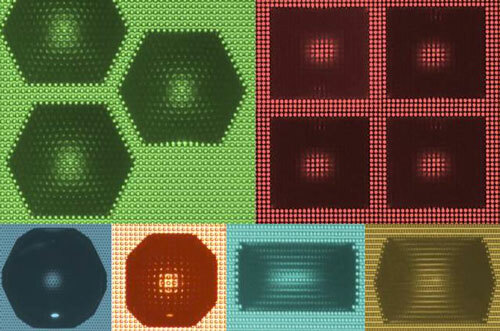 While the shapes are controlled by the underlying patterning, those nanopatterns — simple, regular grids — do not directly correspond to the shapes formed by the resulting droplets. These shapes result from the interaction of those patterns, and the angles formed by their rows of round or square pillars, with the growing and spreading of the liquid in the growing droplets. This work could lead to a new liquid-based printing strategy, Wang says, such as for placing tiny dots of protein or DNA used as assays in biological or medical testing, or for the tiny spots used to make LED arrays for display screens. “We can do it in a very controlled way, and can get them very densely packed,” she says. To date, the system has been demonstrated only with water, but Wang says it is a versatile platform that could, in principle, be used with almost any liquid. The work involved both computational modeling and experimental confirmation, using “a very simple model that very well predicts the kinds of shapes we can create,” she says. The new method, Wang says, should be cheaper than the standard silicon-based lithography used to make microchips and should also allow more flexibility in the shapes created.